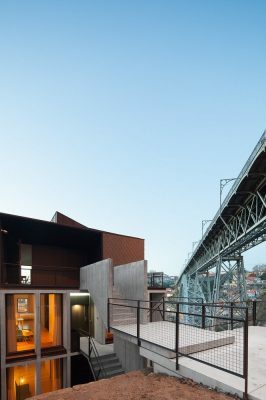 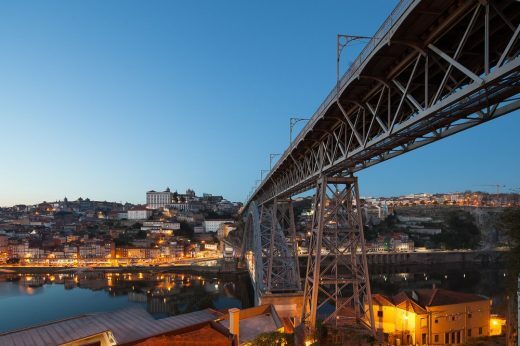 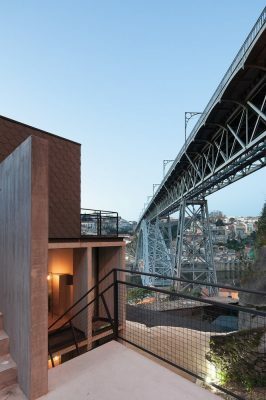 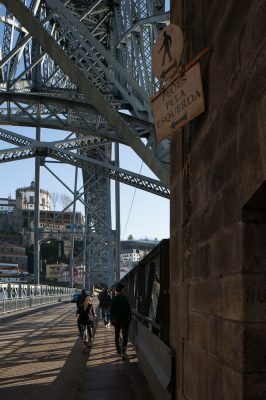 A building on a privileged site in dialogue with the emblematic D.Luís I bridge, the river, facing the houses and Porto´s Ribeira, embedded within a unique landscape that leads us where the Douro crosses the horizon. 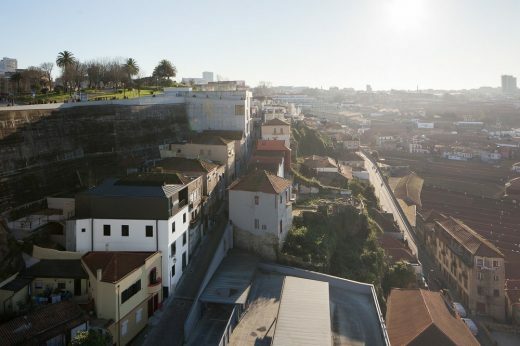 Building on top of this area protected under the flag of Unesco with its charming historical character, was a delicate process – a deep reflection made of very strong restrictions. 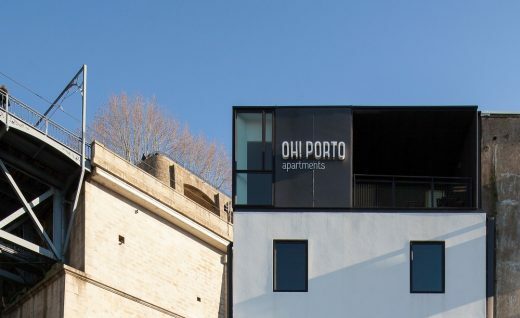 The existing building, buffeted by abandonment and full of add-ons, would have to adapt to a new type of use: apartments for local tourism. 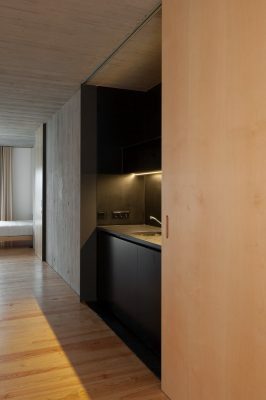 On four floors, measuring 13.80m by 7.20m, it was necessary to organise five independent studios for flexible use, a penthouse, a reception with a common kitchen, back office and technical areas. 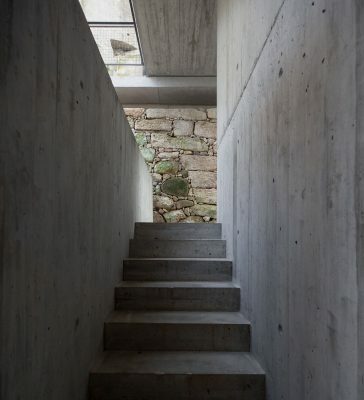 1- a longitudinal concrete axis serving as backbone to support the existing structure and to solve all the technical necessities: bathrooms, kitchens, vertical ducts, lighting and the elevator. 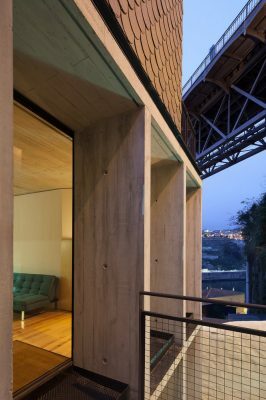 Applying this layout, the studios became open spaces and the longitudinal view: the courtyard versus the Oporto, the Douro river, the bridges, and the ocean. 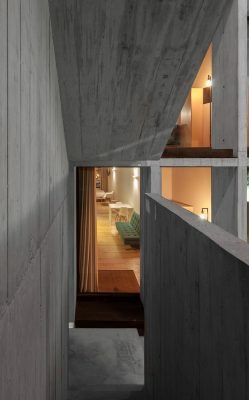 2 – a staircase, on the concrete spine alignment, connects all floors and different exterior areas. 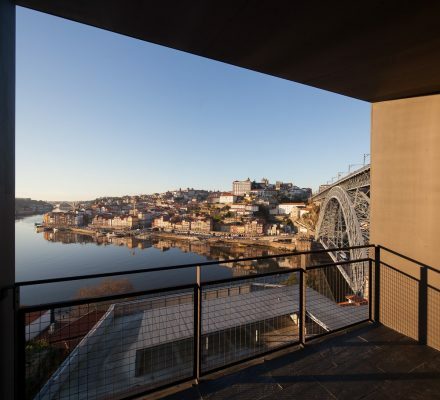 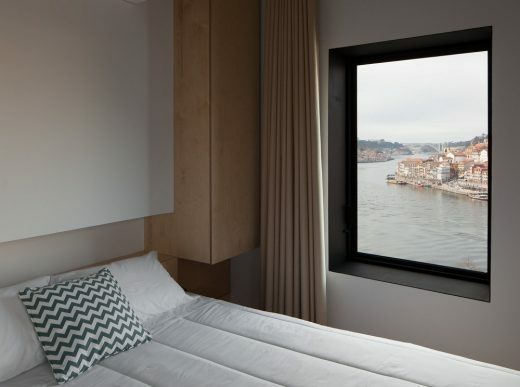 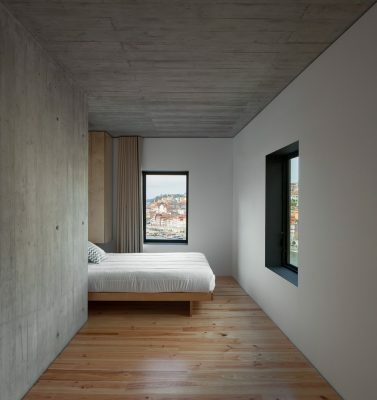 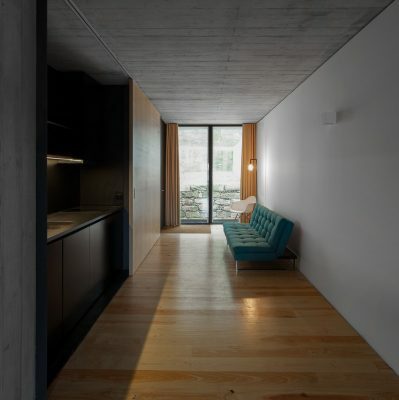 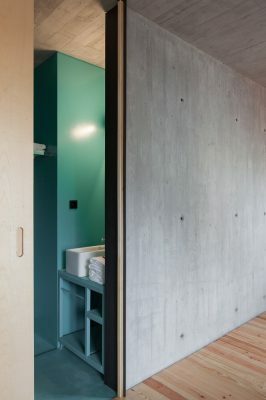 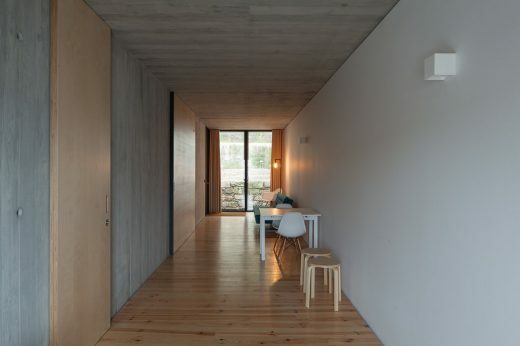 3 – a new volume, assuming as an “add-on”, with the typical black slate outside skin- two bedroom apartment with a large living room facing the best panoramic views towards Oporto. 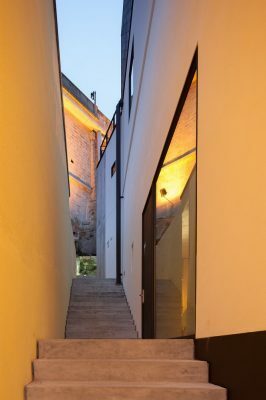 The proposal is expressed along a longitudinal section, between the margins of reconstruction, the new structure and the backyard areas, from the street level to the top. 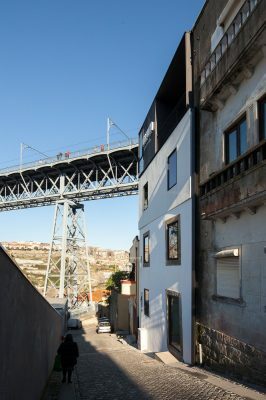 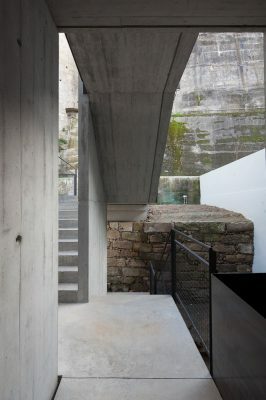 These relations enhance the inner experience of the building, framing the construction site challenged by conditions concerning space and light, became the design themes, articulating different levels of privacy within the excavated granite, under tension with the sculptural stairs, the back concrete hill and the D.Luís I bridge. 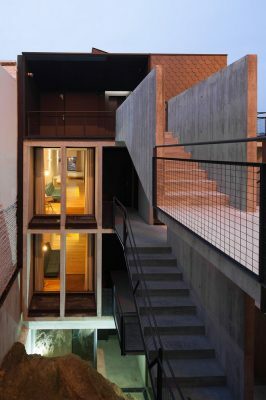 From the inside, the building, reveals the structural and conceptual narrative. 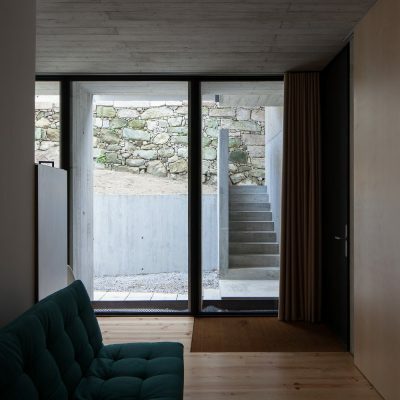 The concrete slabs and walls, show the spine which holds the thick granite walls, with the existing windows as framed views. 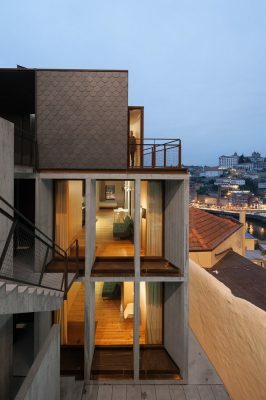 And the penthouse, as it is a penthouse, is white!